Start / Finish : Old Dungeon Ghyll, Great Langdale Valley. Eager to take advantage of the current snow state I decided that my first proper winter hike of the year should be in familiar territory. 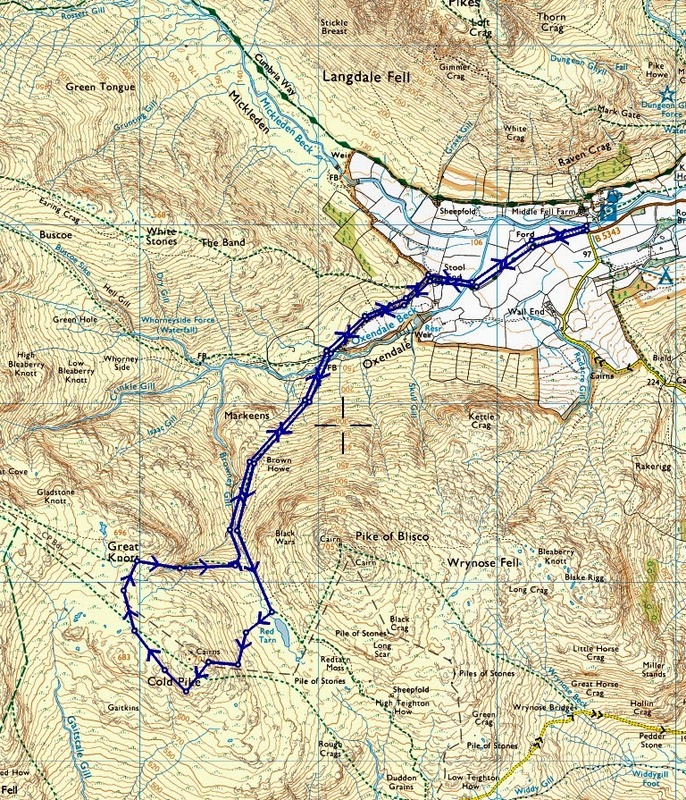 I have walked up the Oxendale path towards Crinkle Crags many times but have never made the short diversion to Cold Pike. So this was the target for today. After that, it would depend on the conditions. I planned to either carry on along Crinkle Crags or head back the same way. As it turned out the snow was quite deep and made uphill progress difficult. The climb up to Cold Pike therefore took longer than anticipated and so with no summit views to encourage me onwards, I headed back down along the same path. So it was just the one Wainwright today. Looking back along the Great Langdale valley on the way back down.